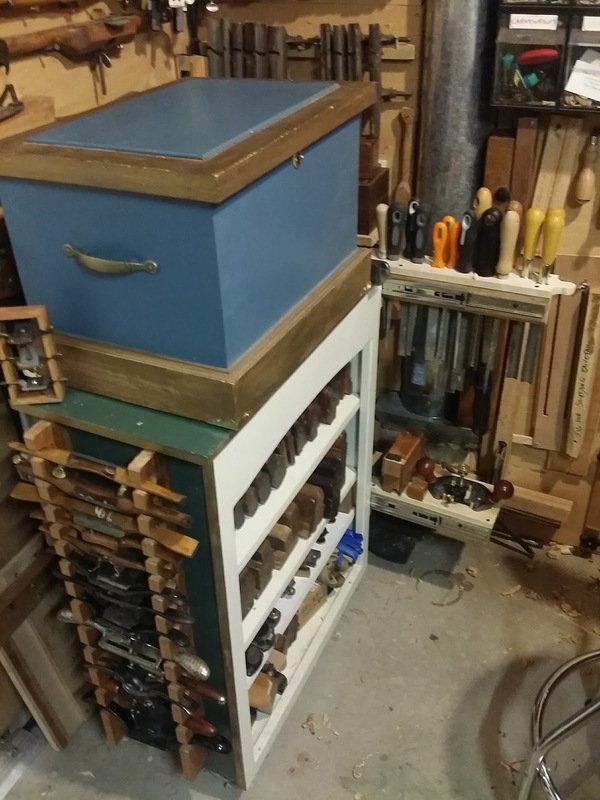 My woodworking workshop measures a meager 10' x 6'; yet, despite the tiny size, it still serves as my woodworking oasis. Like most workhops, its function and appearance continually change. 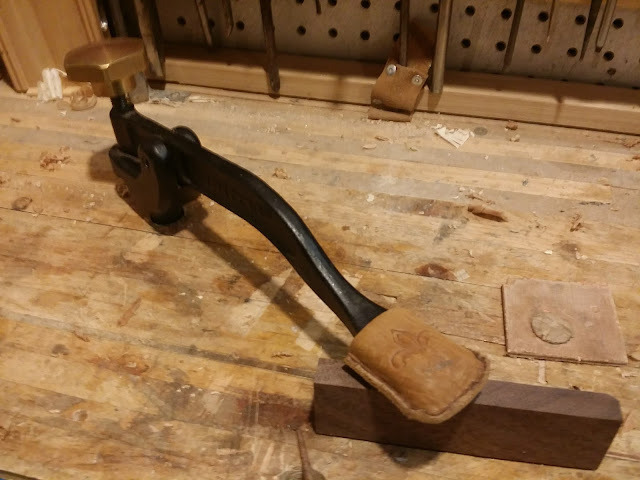 Below is an updated VR tour after adding on a tail vise, decluttering (to allow room for more tools of course! 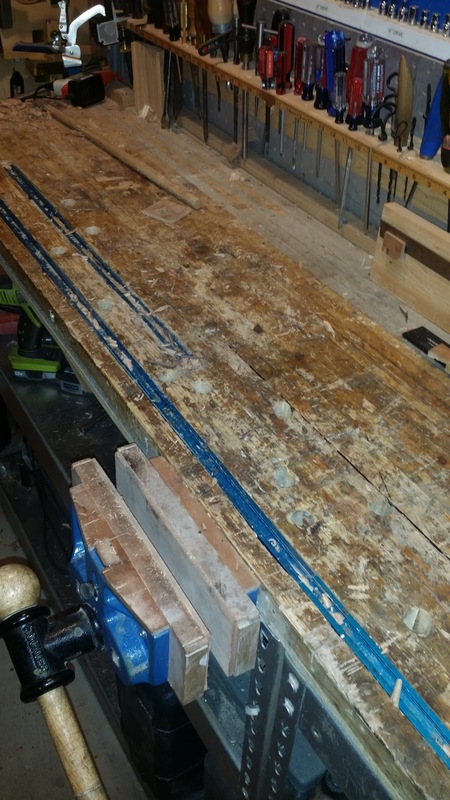 ), and new flooring. 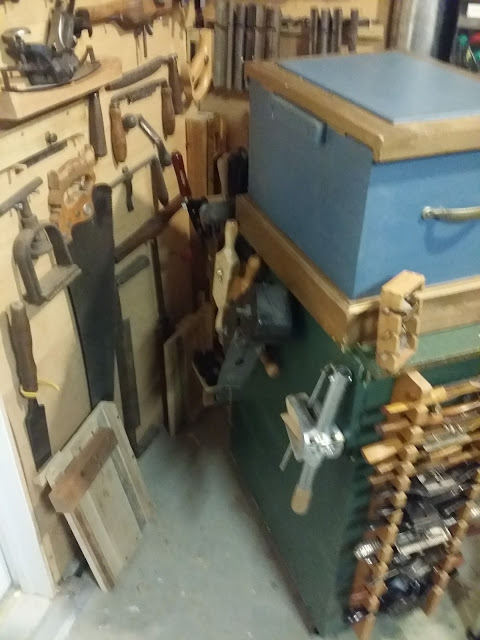 May my shop ever be so tidy again! The original space was a walk-in closet that we used to store bicycles which shared space with the HVAC and hot water heater. 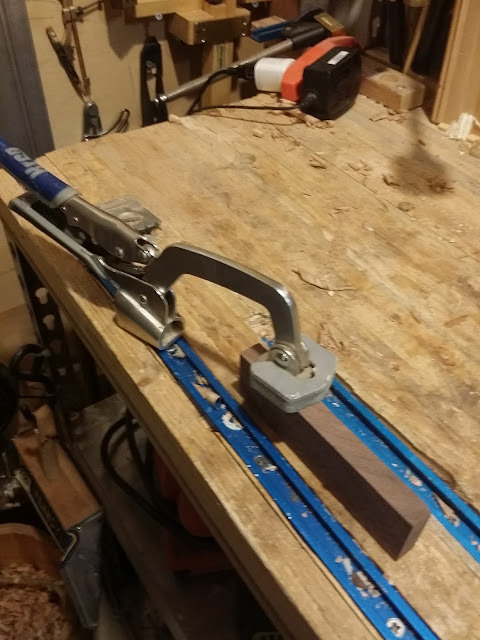 Not enjoying DIY work in the garage during the cold winters and hot summers, I then swapped the bikes into the garage and brought my general purpose DIY tools indoors. 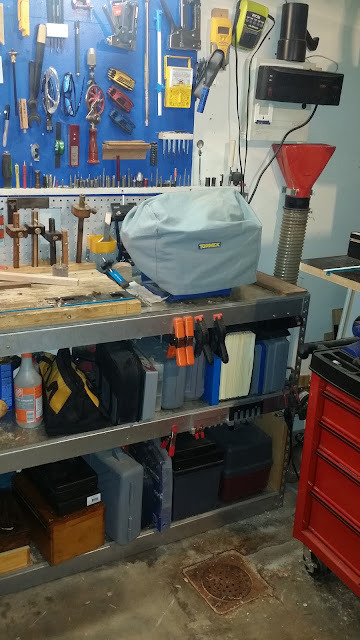 A cheap workbench and small parts storage rack were added. 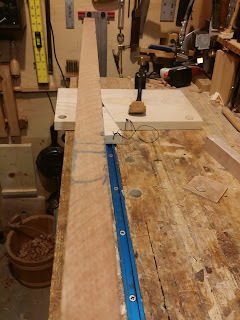 At that point, I did not consider myself a woodworker. Any woodworking, such as mouldings or studs for a new wall, was usually afixed to the house. 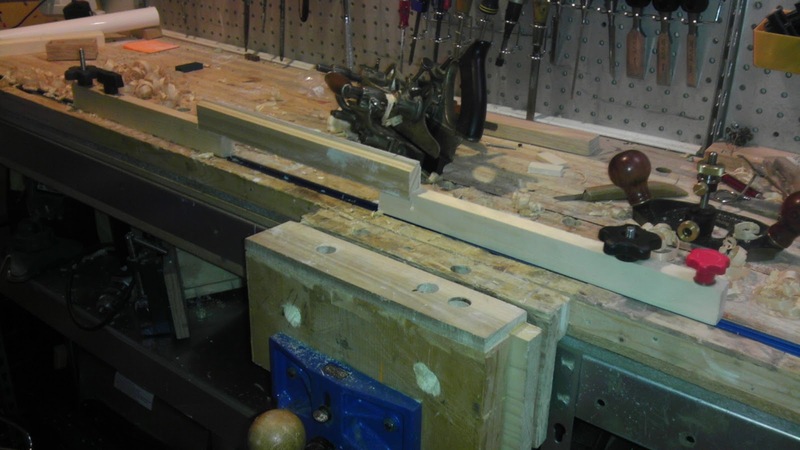 My foray into woodworking as a hobby only began about 6 years ago. 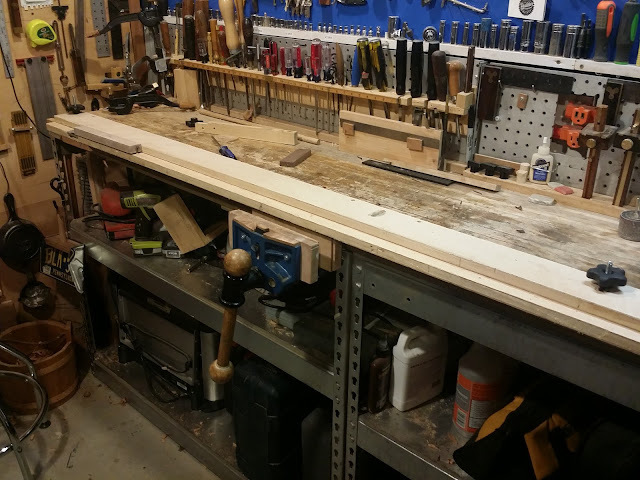 I added a workbench by gluing strips of scraps of pine and even MDF together to make a slab that fits on top of the old thin plywood topped workbench. 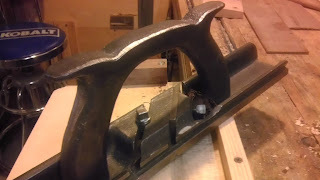 A woodworking front vise was then added. There was not enough room for a tail vise. With all of the tools underneath, the bench is very solid when planing. Workbench made of scrap wood. While far from perfect, it has held up for about 5 years of abuse. 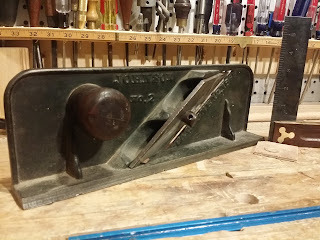 From there, the shop has been in continual flux as I have acquired various hand tools and jigs and figured out different methods of work. 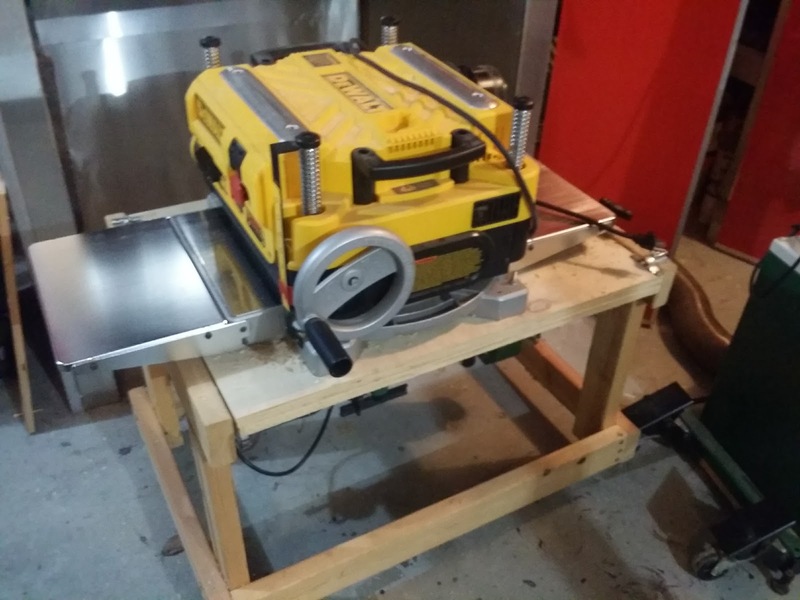 The plan was to keep my power miter saw in the shop and get a bench top bandsaw. Luckily, my original plan of placing a dust collector in the small space to the right of the workbench failed. The stated dimensions on the canister type dust collector (DC) from Penn Sate Industries were only partially correct. The DC was 22" wide at any point, but the stand was staggered giving the dust collector a wider footprint. I called Penn State Industries about the return policy and the gentleman on the phone was very helpful. We worked out a plan to place the DC in the garage, which shares the wall with the workshop, and sending a duct through the wall. 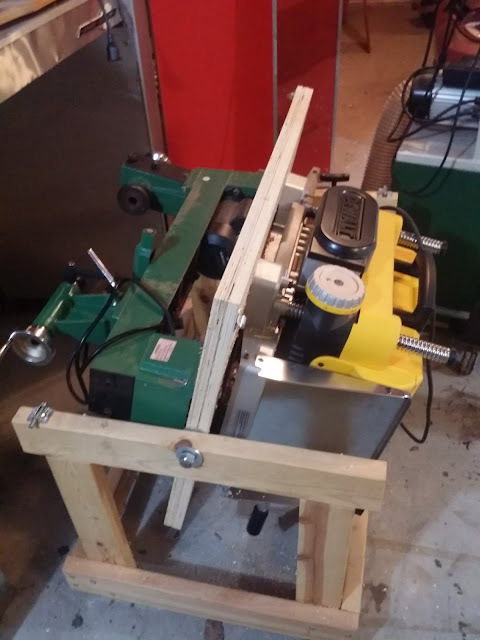 This move saved valuable space in the tiny shop, reduced noise and allowed me to think about getting a more substantial bandsaw as well as a planer for milling large boards in the garage. 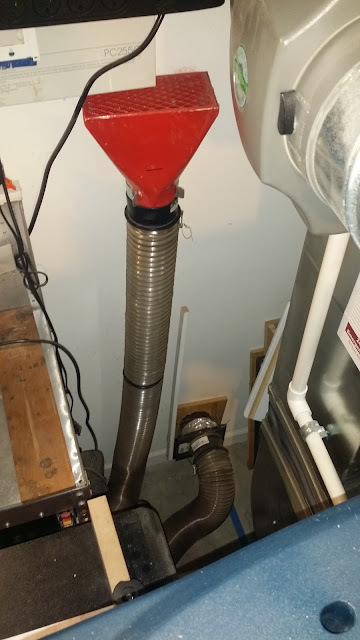 (The downside of the DC in the garage is sucking out conditioned indoor air.) 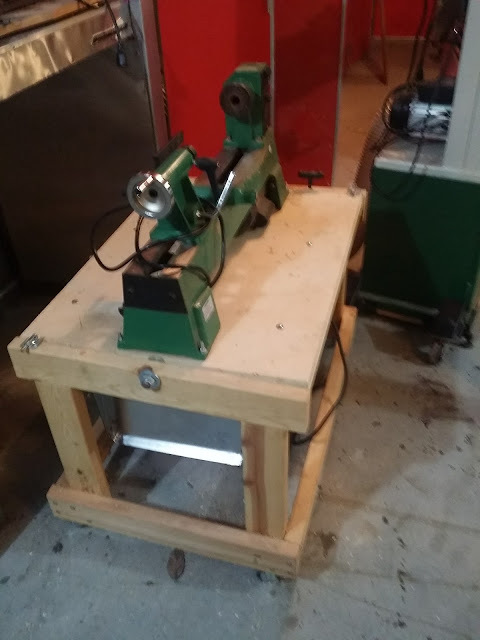 So, I have annexed a portion of the garage for lumber storage and the major power tools: a small lathe, a bandsaw, dust collector and a lunchbox planer. 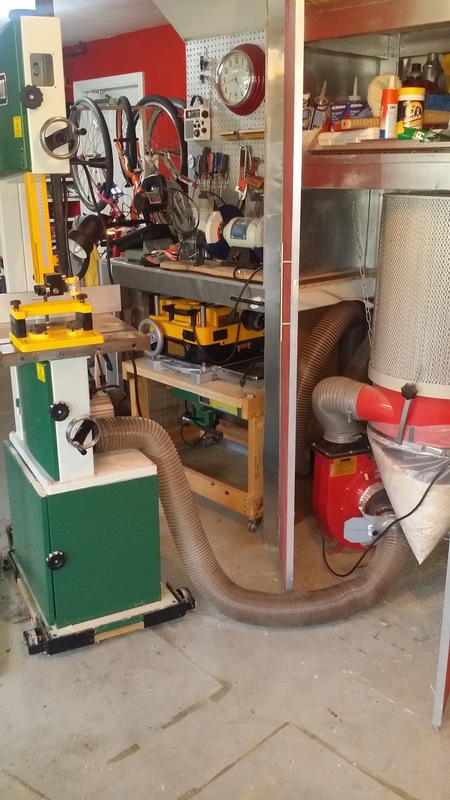 Boards are milled in the garage using a fairly small footprint. 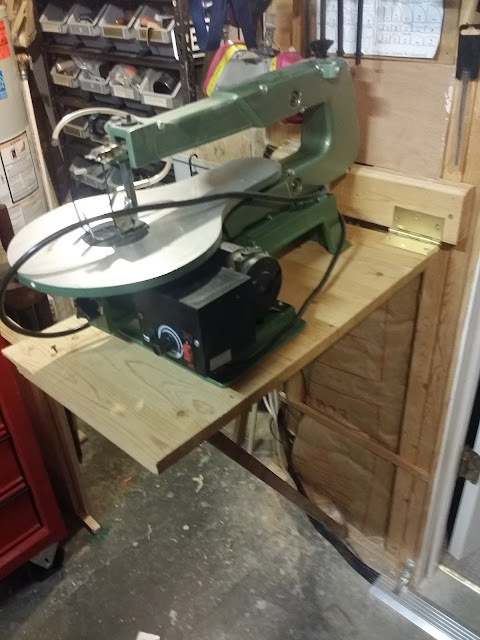 The lunchbox planer and small lathe share a flip top table. There is a Y connector on the DC with one branch heading through the wall into my workshop. The key design feature of the table is a very strong central rod that is sandwiched between two glued 3/4" plywood panels. This poor rejected kitchen cabinet is chock full o' hand tools. 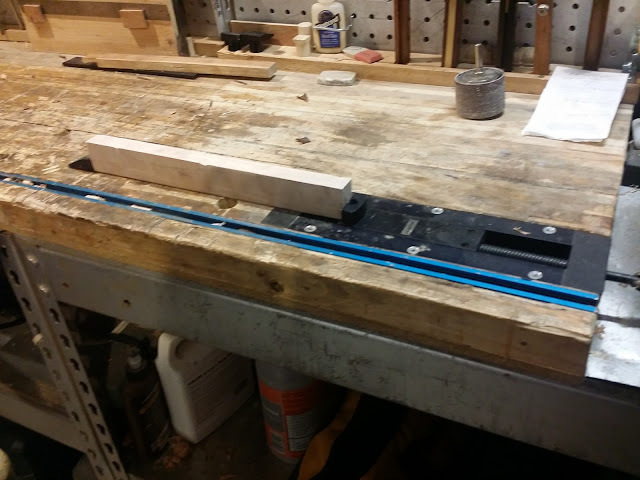 The rasps, files and router are stashed away using drawer slides attached to the side of the cabinet. 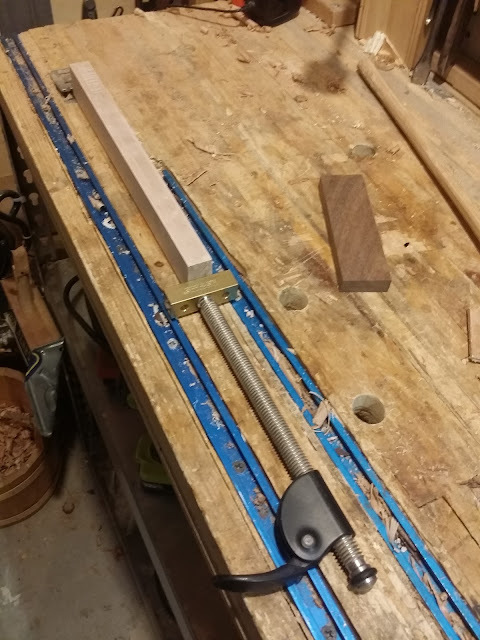 For some mouldings, I use an adjustable width sticking board that attaches to workbench top via T-bolts. 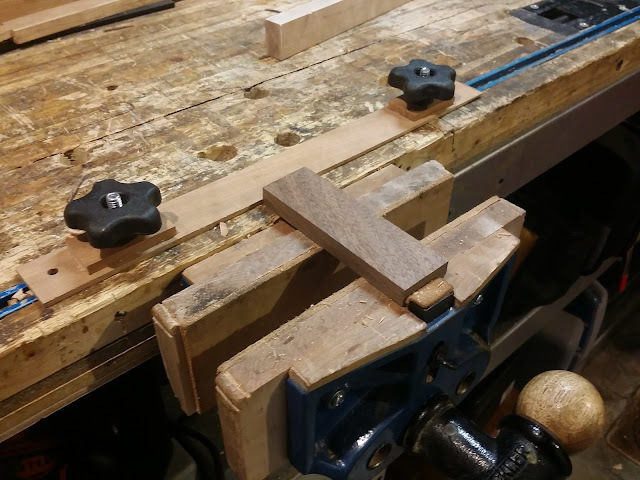 A mortised bench stop on one end and a screw on the other helps secure the stock. Some additional thoughts to make your small woodworking workshop an enjoyable place to work. 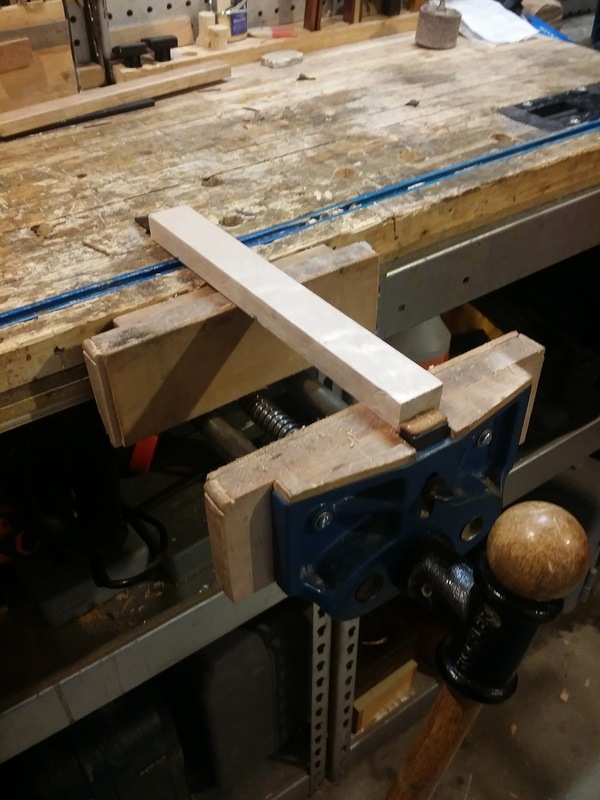 Try to convert a frustrating part of the shop into a gem. For storage, think vertically. Every inch of wall space is important. Tools need to be organized in a compact manner using wall space from floor to ceiling. The tiny space forces me to tidy up on the fly. Matt you present a lot of great ideas for any size shop. 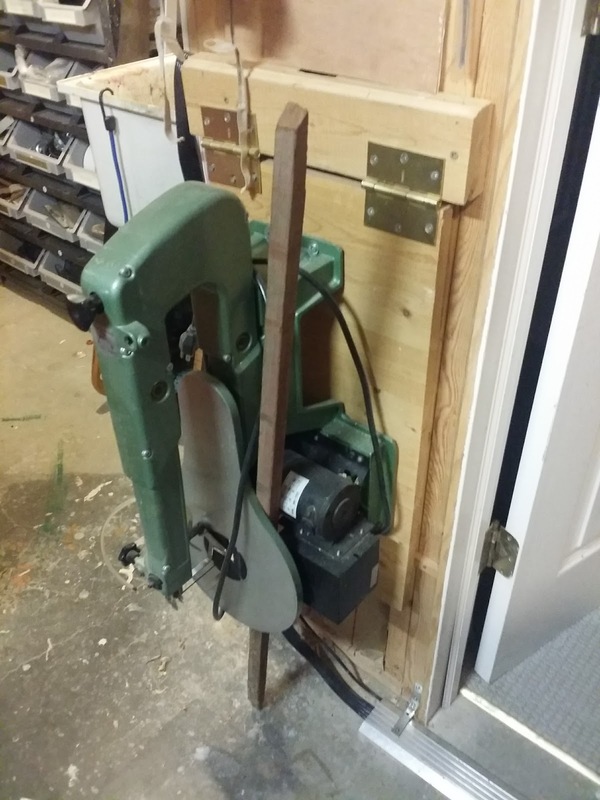 And I will no longer complain about my phone booth shop. What type and who made the shooting board plane you have? I have never seen one like that? It's a JOHNSON No. 2 shooting board plane, patent 1866. It was supposed to have an adjustable metal shooting board that can help you make different angles (think adjustable donkey's ear shooting board). Picture posted above. I know very little aboout the plane. Nicely done and well organized. With limited space, you've gotta be diligent about keeping it clean. Thanks. I read through some of your blog. Some interesting posts. I saw a glimpse of your shop in which it looks like you are using some of your garage. The weather in my region does not make that option enjoyable.